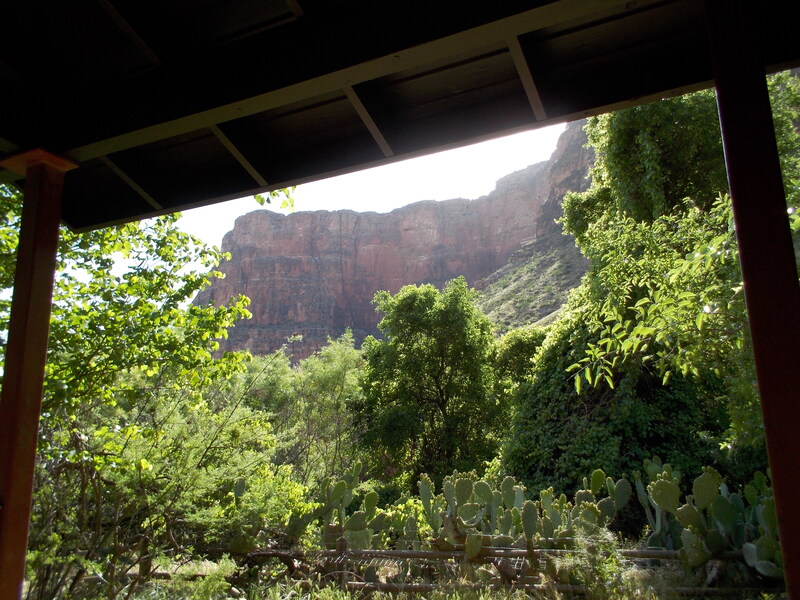 Indian Gardens is a lush oasis halfway down the canyon. It is surrounded by steep vermilion walls. A small creek flows through the campgrounds leaving the trail muddy in spots. We pitched our tents under a large willow tree. After a nap and lunch, I was ready to hike to Plateau Point. It was only me and the boys, as everyone else elected to cool off in the creek. 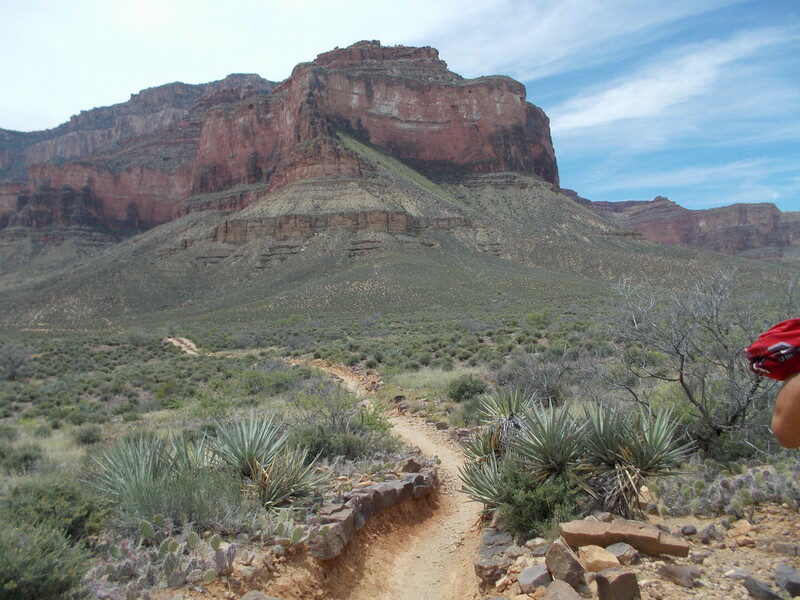 The trail to Plateau Point is relatively flat but totally exposed. We were hiking in ninety-degree heat, but without our packs it wasn’t so bad. 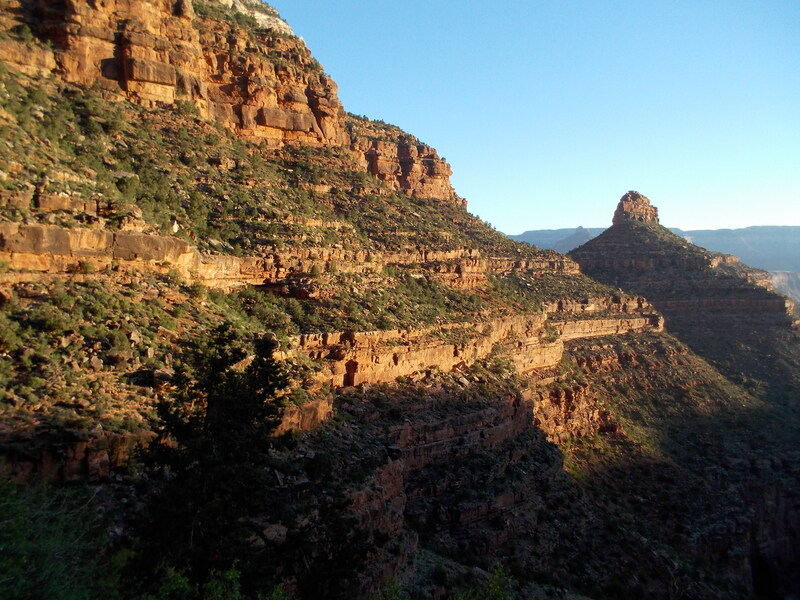 When we reached Plateau Point, we could look down at the Colorado River. From another vantage point, we could see much of the trail we had hike that morning. While we were enjoying the view, we encountered an Asian couple who asked us to take their picture. In return, we asked them to take ours. As we hiked back, we caught up with the couple. She asked, “Grandma, how old?” I told her that I am sixty-eight. She said that she is sixty-two, but her grandchildren are much smaller than mine. Still, I decided to stick with my plan to get up early. After dinner, I got my pack ready and then did my best to sleep in spite of the wind that was trying to carry me away in my tent like Dorothy in the Wizard of Oz. At three o’clock, I was up and getting ready. This time no one else stirred. The entire campgrounds was still except for me scurrying around like a large squirrel. At four o’clock I was hitting the trail and by five I had reached the Three-Mile rest stop. After a brief pause to have a snack, I pressed on. I had passed the One-and-a-half-mile rest stop before I could reach anyone on the radio. Mike and Vikki were the last to break camp and they were on their way out. I had just over a mile to go before reaching the rim. “If you can’t find me, check in the Bright Angel Lodge. I’m going there for breakfast,” I told Mike. The last part of the trail is the most challenging. Hikers were coming down the trail, but I was the only one going up. Just as I was nearing the end of the trail, I encountered two rangers. “Where’s my banner and confetti?” I asked. 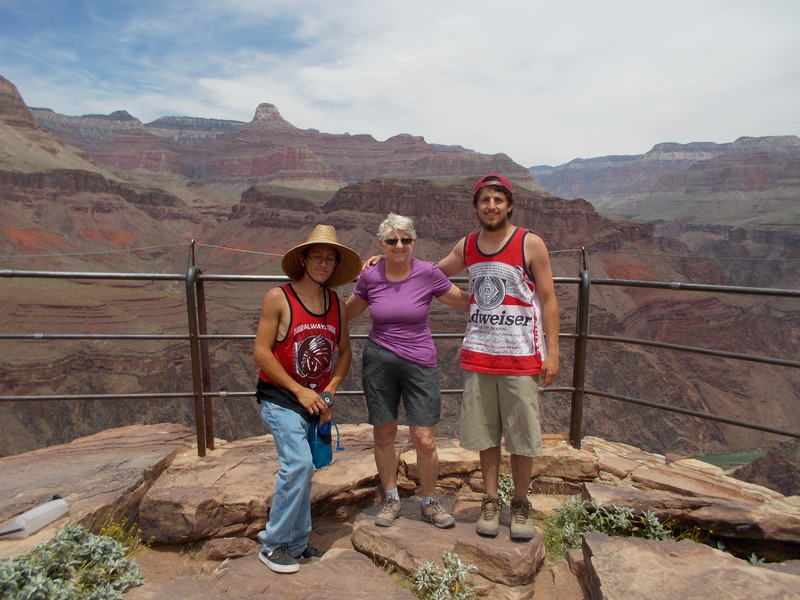 “I’m the first hiker out of the canyon today.” They were impressed that I had hiked out in only four hours. I was elated that I had made it all by myself. As I told Mike I would, I headed for the lodge and ordered a huge breakfast. Real coffee and food that had not previously been freeze-dried was all I could think about. After breakfast, I still had an hour to wait before the rest of my party began showing up. Loaded in Mike’s truck, we headed for home and a much-deserved rest. I had done it! I could check this one off my bucket list. That first night in Bright Angel Campgrounds, Mike told me that if I ever got another one of these hair-brained ideas , they weren’t in. I would like to say that I now have it out of my system, but the truth is I can’t wait to do it all again. Who will go with me? Maybe I’ll go it alone this time. I guess I’ll just have to wait and see.